A mother is upset after a teacher gave her 13-year-old son, who is diagnosed with ADHD, an ADD "award" in front of his whole class. A Plainfield mom is furious after she said her son, who is diagnosed with ADHD, was given a so-called “award” by his teacher for getting distracted often. NBC Connecticut spoke exclusively to Tera Cooper, who said she’s confused why that teacher at Plainfield Central School would think it’s funny to give something like this to her 13-year-old son, Derek. “He had tears in his eyes. He’s embarrassed because he had to accept it in front of his entire class,” Cooper said. 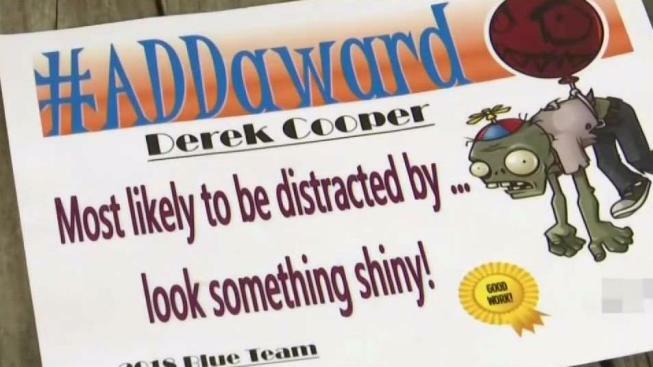 While she never met the teacher, Cooper said the school and the teacher know about Derek’s ADHD. “He is on a 504 plan at the school, so she is aware of it. I don’t know if she thought it was funny but it’s not funny. She’s the teacher. It’s supposed to be a safe place,” Cooper said. A 504 plan is an educational plan that could include changes in a child's educational program. The plans are for students who would not need special education but qualify under Section 504 of the Rehabilitation Act of 1973, which prohibits discrimination against people with disabilities. In a statement sent to NBC Connecticut on Monday, Principal Scott Gagnon said he was made aware of the incident Friday evening and met with the seventh grader’s parents at the school Saturday morning. Plainfield Public Schools Superintendent Kenneth Di Pietro said in an email Wednesday that he will not comment until the investigation process is completed since this is being addressed as a personnel issue. Cooper said she is going to talk to a lawyer about potentially taking legal action. “Hopefully make change. Make the administration more involved in what teachers are doing and protect the students from having to deal with something like this in the future,” she said. Derek did receive two other awards from the same teacher, Cooper added. One for being the most improved in social studies and one titled “#BermudaTriangle” that reads, “Most likely to borrow stuff and it never coming back!” The certificates have a picture of a skeleton and a zombie respectively and the same “good work” ribbon. Cooper said Derek told her that a couple of other students received the ADD “award” too. Reporter Heather Burian emailed Principal Gagnon inquiring about it but did not hear back by the time this story aired. NBC Connecticut also reached out by email to every member of the Plainfield Public Schools Board of Education for comment but did not hear back.